Charleston South Carolina is very well known for its beauty and southern charm. Being a historic city that has always been very well preserved for its history ranked the No. 1 City in the US, and No 10 City in the world by Travel + Leisure's. In addition the # 1 wedding destination for the southeast. While there may be an average of 60 to 80 weddings held on every weekend, many new bride and groom look for that special charm that meets their needs with the so many variations for what Charleston, SC has to offer. Google is always busy helping new clients with the wealth of information it stores. One of the most searched terms is wedding photographers the battery. A landmark for every tourist and bride and groom, along with the peninsula that stretches along Charleston, a promenade of the east battery featuring all of the antebellum homes. Truly a spectacular, calm breathtaking view. Wedding clients love the park located along the battery called White Point garden. Truly a landmark featuring Fort Sumter with the historic monuments & cannons, along with the beautiful oak trees and the pink gazebo that wedding clients love. ..Being a Charleston Wedding photographer for over 18 years. I am very accustomed to this area. More importantly how to pose my clients, in the proper location, while knowing that this park is always so very busy with many tourists and onlooker. I also always bring many elements in lighting to create amazing compelling wedding images. My clients understand that I am A lighting expert. 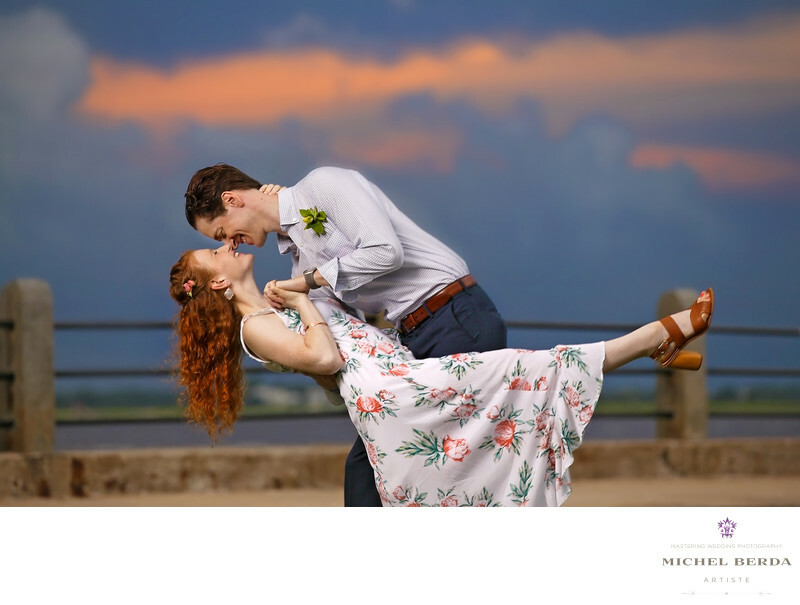 Sunset on the Battery are exceptional, and capturing wedding clients properly to feature all of the impacts of this setting and sunset, that is what I do best. Here is a perfect example of what you can expect from me when you are looking for wedding photographers the battery. Simply perfection and wedding images like no other. Keywords: Charleston (1179), Holy City (6), king street photo weddings (219), Michel Berda (1140), photographer (1125), the battery (3), Wedding Photographer (1254), white point garden (3).